Remember the good old days, when adventures were underground, NPCs were there to be killed, and the finale of every dungeon was the dragon on the 20th level? Those days are back. Dungeon Crawl Classics don't waste your time with long-winded speeches, weird campaign settings, or NPCs who aren't meant to be killed. Each adventure is 100% good, solid dungeon crawl, with the monsters you know, the traps you fear, and the secret doors you know are there somewhere. The Stormbringer family of storm giants has long extorted gold from coastal towns as a "good weather tax." Fed up by rising taxes, the towns recently sent a band of stalwart adventurers to finish off Stozari Stormbringer for good (as witnessed in DCC #21: Assault on Stormbringer Castle). 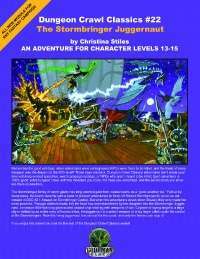 But when the adventurers struck down Stozari, they only made her more powerful. Through eldritch rituals, her life force has been transferred by her daughter into the Stormbringer juggernaut, a massive 800-foot-long giant-scaled assault ship bristling with weapons of war. Capable of laying siege to a large city or defeating an entire navy of human ships, the juggernaut is a potent weapon to bring larger cities under the control of the Stormbringers. Now this living juggernaut has set sail for the coast, and only the heroes can stop it! A dungeon crawl inside the unique setting of an enormous living ship. A stand-alone adventure that can be played as a sequel or prequel to DCC #21: Assault on Stormbringer Castle, or on its own. This title was added to our catalog on December 03, 2005.